To maintain the integrity of your data, it’s a good idea to have rules in place to reduce duplicate records in the system. 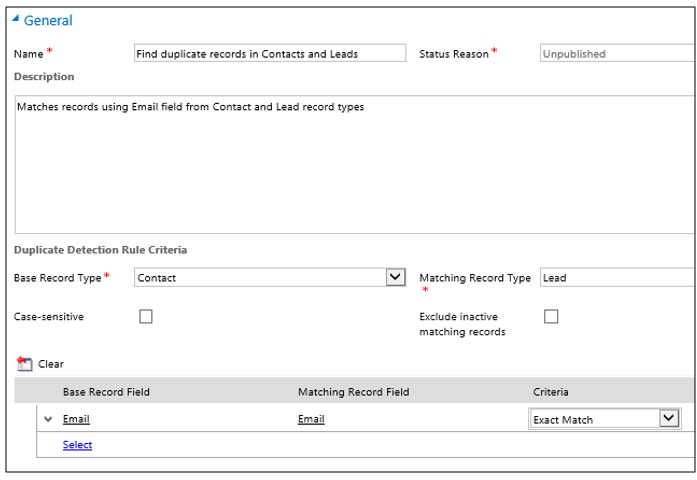 Microsoft Dynamics CRM includes default duplicate detection rules for accounts, contacts, and leads, but not for other types of records. If you want the system to detect duplicates for other record types, you’ll need to create a new rule. After you’ve created duplicate detection rules, you need to turn duplicate detection on. Make sure that you have the System Administrator, System Customizer, Sales Manager, Vice President of Sales, Vice President of Marketing, or CEO-Business Manager security role or equivalent permissions. To create a new duplicate detection rule, choose New. Type a name and description. To edit an unpublished existing duplicate detection rule, choose the duplicate detection rule. To edit a published duplicate detection rule, select the rule. On the Actions menu, choose Unpublish, and then choose the rule. Select the criteria to be used to identify a record as a duplicate. In the Duplicate Detection Rule Criteria section, in the Base Record Type list, choose the type of record that this rule applies to. For example, select Contacts. In the Matching Record Type box, choose the type of record to compare. In most cases, you’ll probably want to use the same record type for Base Record Type and Matching Record Type. It’s also useful to be able to compare different record types. For example, you might want to compare the Email field in Contacts to the Email field in Leads. b. If you want the rule to consider only active records while detecting duplicates, select the Exclude inactive matching records check box. You should also select this check box if your duplicate detection rule criteria are based on a status field. c. If you want the rule to be case-sensitive, select the Case-sensitive check box. d. If you selected different record types for the base and matching record types, for each new criterion, in the Base Record Field column, choose Select, and then choose a field name. In the same row, in the Matching Record Field column, choose Select, and then choose a field name. If you selected the same record types for the base and matching record types, for each new criterion, in the Field column, choose Select, and then choose a field. e. In the same row, in the Criteria column, choose Select, and then choose an operator. For example, select Exact Match. f. If you specified Same First Characters or Same Last Characters, in the No. of Characters column, choose Enter Value, and then enter the number of characters to compare. g. If you don’t want the rule to consider blank fields (null values) as equal while identifying duplicates, select the Ignore Blank Values check box. If the duplicate detection rule contains only one condition, blank values are ignored during duplicate detection job. The number of criteria that you can select is limited by the number of characters that can be stored in the matchcode for the record. As you add criteria, watch the Current matchcode length value shown at the bottom of the criteria list. When you’re finished adding criteria, choose Save and Close. To make the new or changed duplicate detection rule usable, select the rule, and then choose Publish. When you publish a duplicate detection rule, a matchcode is created for every record in the matching record type for that rule. You can publish only five rules for the same base record type (Account, for example) at a time. You might need to delete or unpublish an existing rule if you bump up against this limit. We recommend that you set the duplicate detection criteria on a field that has unique values, for example, Email. You can have more than one duplicate detection rule for each record type. To maintain the integrity of system data, you should check for duplicates regularly to make sure that users don’t inadvertently create duplicate contacts, accounts, leads, or other types of records. The Check for Duplicates wizard helps you set up a bulk “job” that finds and cleans up duplicate records. You can schedule the job to run daily, and you can receive an email confirmation when the job finishes. Choose New, or choose the name of the duplicate detection job you want to run. You’ll see the Duplicate Detection wizard, which helps you create a job to check for duplicates. In the Look for drop-down list, select the record type that you want to check for duplicates. In the Use Saved View drop-down list, select a view if you want to limit the records searched to records in that view. For example, select Active Accounts. When you select a view, CRM adds the criteria to search on. To further limit the records searched, choose Select and then enter the criteria you want. Accept the default name for the job, or type a different name. If you want to receive an email confirmation when the job is completed, select the Email options check box. Enter an additional email address, if desired. Choose Next, and then choose Submit. To maintain the integrity of your data, it’s a good idea to set up duplicate detection rules to reduce duplicate records in the system. Remember that after you create duplicate detection rules, you need to turn them on. Select or clear the Enable duplicate detection check box. If your system contains a large number of records, checking for duplicates can impact performance. The system checks for duplicates when a user enters or updates records. Duplicates aren’t detected when a user merges two records, activates or deactivates a record, or saves a completed activity. For users of Microsoft Dynamics CRM for Outlook, the system detects duplicates when the user synchronizes their data after working offline, as long as users have enabled duplicate detection in Outlook. To enable duplicate detection in Outlook, choose File > CRM > Options. Choose the Local Data tab, and then select the Enable duplicate detection during offline to online synchronization check box. For more information, see TechNet: Delete bulk records. In the Bulk Record Deletion window, you can perform the actions described in the following table. View status Look in the Status Reason column. View detailed status, including success and failure information Select the bulk-deletion job. View queries submitted for deletion Select the bulk-deletion job, and then under Information, choose Properties. Review the errors Select the bulk-deletion job, and then under Related, choose Failures. Pause a bulk-deletion job a. Select the bulk-deletion job, and then on the Actions menu, choose Pause.b. When the confirmation message appears, choose OK. NoteBulk deletion jobs of fewer than 1,000 records cannot be paused. Postpone a bulk-deletion job a. Select the bulk-deletion job, and then on the Actions menu, choose Postpone.b. When the confirmation message appears, choose OK.
Resume a bulk-deletion job a. Select the bulk-deletion job, and then on the Actions menu, choose Resume.b. When the confirmation message appears, choose OK. Cancel a bulk-deletion job a. Select the bulk-deletion job, and then on the Actions menu, choose Cancel.b. When the confirmation message appears, choose OK. Modify recurrence of a bulk-delete job a. Select the bulk-deletion job, and then on the Actions menu, choose Modify Recurrence.b. If you select the Run this job after every check box, specify the interval after which you want the bulk-deletion job to run, and then choose OK.If you select the Run this job after every check box when you create a bulk-deletion job, the job becomes recurring and is moved to the Recurring Bulk Deletion System Jobs view. You can only change the recurrence for these recurring bulk-deletion jobs. Several Microsoft Dynamics CRM features use system jobs to perform tasks automatically, including workflows, import, and duplicate detection, running independently or in the background. You can monitor them to ensure that they run smoothly or have completed successfully. If there is a problem with a system job, you can cancel, postpone, pause, or resume it. You cannot resume a cancelled system job. Postponing an active system job stops any current and subsequent actions. You can specify a later time when you want the system job to restart. You can resume a paused system job. Resuming restarts a system job that was paused. a. If a system job fails, you can view the details about what steps failed and what the problems may have been. First, open the system job record. To display details about system job failures, move your pointer over the warning symbols. b. To view system job failures in a format that you can print or copy and paste, click the Print button. You cannot make changes to the status of a system job that has been completed or cancelled. Or, you can use mail merge with Microsoft Office Word and Word templates to create the message. In the web app: Choose the More Commands button , and then choose Send Direct Email. In CRM for Outlook: In the Collaborate group, choose Send Direct Email . Or, just choose Send Direct Email to send email to everyone on the list. In the Send Direct Email dialogue box, select the template you want to use. Or, if sample data isn’t installed on your system, you may want to add it for training purposes. Later, when you’re ready, you can remove it. Use sample data to learn and play around with system features. However, to avoid unwanted results, don’t associate it with any data you actually need. Choose Sample Data. You’ll see a message that tells you whether the sample data is currently installed. Choose Remove Sample Data, then choose Close. Choose Install Sample Data, then choose Close. Microsoft Dynamics CRM includes duplicate detection rules for accounts, contacts, and leads. These rules are automatically turned on, so you don’t have to do anything to set up duplicate detection for these record types. If available on your system, you may also be able to check for duplicates of other record types, in addition to contacts, accounts, and leads. Check with your system administrator. How many sub-accounts are there under one big account? How much annual revenue is there for all the sub-accounts under an account hierarchy? How many opportunities or leads is your team working for a big account, and what is the net open revenue for all the related accounts in the hierarchy? How much time have we spent working a big account and all its sub-accounts? With Microsoft Dynamics CRM, you can set up rollup fields to perform calculations across related records without writing code or involving a developer. For Microsoft Dynamics CRM Online organisations, this feature is only available if you’ve installed the CRM Online 2015 Update. For on-premises CRM organisations, this feature is only available if you’ve updated to CRM 2015. With Microsoft Dynamics CRM, you can set up calculations across multiple records without writing code or involving a developer. You can use calculated fields to automate manual calculations in your business processes. For example, you can automatically apply a discount if an order is greater than $500. A calculated field can contain values resulting from simple math operations, or conditional operations (such as greater than or if-else), and many others. For information on the syntax to use with calculated fields, see TechNet: Calculated field functions syntax. The way your organization works is unique. For example, you may need to create your own custom record types (entities) forms, and views, or set up new workflows or other business processes. With Microsoft Dynamics CRM, you can customize your system to fit the needs of your business. To understand what’s possible, and how to customize your system, see TechNet: Customise your CRM system.